How Buffa-Low Can You Go? 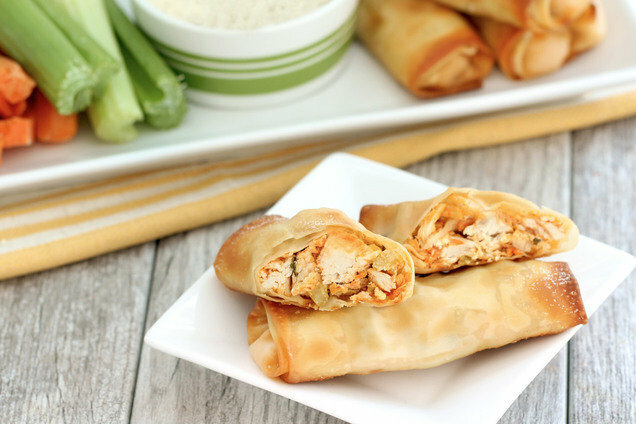 Who says Buffalo wings and egg rolls can't coexist in one delightfully low-calorie package? Not us! This delicious food mashup is perfect for snacks, mini meals, and party-time appetizers... Roll 'em, bake 'em, love 'em! Place chicken on the center of the foil, and sprinkle with salt and pepper. Cover with another large piece of foil. Fold together and seal all four edges of the foil pieces, forming a well-sealed packet. Meanwhile, in a medium bowl, mix cream cheese with hot sauce until mostly smooth and uniform. Cut packet to release hot steam before opening entirely. Transfer chicken to a medium-large bowl. Shred using two forks. Add cream cheese mixture, carrots, celery, scallions, and blue cheese. Mix well. Lay an egg roll wrapper flat on a dry surface. Evenly distribute about 1/6th of the chicken mixture (about 1/3 cup) in a row a little below the center. Moisten all four edges by dabbing your fingers in water and going over the edges smoothly. Fold the sides about 3/4 inch toward the middle, to keep filling from falling out. Roll up the wrapper around the mixture and continue to the top. Seal with a dab of water. Place egg roll on the baking sheet, and repeat to make 5 more egg rolls. Spray with nonstick spray. Bake until golden brown, 23 - 25 minutes. Time-Saving Tip: Start with 6 oz. precooked skinless chicken breast (shredded or finely chopped) to shave 25 minutes off your cook time! Hungry for More Healthy Buffalo Wing Recipes? Today, January 9th, is National Apricot Day, which always seems weird to us, since apricot season is during the summer. Good thing our slow-cooker Glaze-of-Glory Candied Carrots call for apricot preserves, which are always in season!